We’re excited today to introduce a new, three-part mini series to the blog. For each part in this series, we’ve paired up two different emerging APIA poets and have asked them to answer a set of four identical questions. 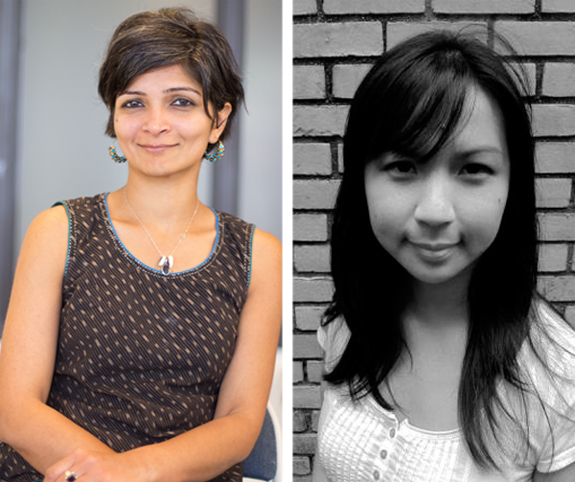 Today’s installment features two poets with very different aesthetic styles but intersecting thematic interests: Monica Mody (author of Kala Pani, which was recently published by 1913 Press) and Cathy Linh Che (author of Split, forthcoming from Alice James Books in April). LR: In the wake of Valentine’s Day, we’ll start with this: what are your literary obsessions, and what breaks your heart? MM: Literary obsessions // Poems that catch me by my throat & pull me into the heart/breast of the poem. That dwell in the mouth of the beast and its opposite, its wholeness. That trigger an ache in the body, or bliss. On whom the eye falls and there is nothing but light. Poems of the earth, troubled about the relationships of humans with non-humans. That peel the crust of indifference off my eyes. Some of these poems have not yet been written. Two collections that I am looking forward to being obsessed with are Lucas de Lima’s Wet Land, and Sorrowtoothpaste Mirrorcream, Don Mee Choi’s new translation of Kim Hyesoon. Heartbreaks // When poets write only to follow trends or to matter to the opinions of others, rather than let their hearts be broken in the writing of poems or dragged by wildness into that space that is of the animal the plant, relational, non-speaking, verboten. // When poets stay on the surface of poetry, stymied at the edge not jumping, stay with the dry husk of consensual meaning and consensual reality, stop themselves with rules and how-to’s. CLC: Who are my literary obsessions? Anne Carson, Claudia Rankine, Maggie Nelson, Srikanth Reddy, Jack Spicer, Sharon Olds, Sylvia Plath, and James Baldwin. I’m interested in precise, intelligent, beautiful writing that takes great risk. What breaks my heart (in the best kind of way): honesty. My own and other people’s ability to speak up and out about issues that feel exposing and vulnerable. LR: Tell us about the genesis of your book. How did the seed of it come to be? MM: I must have been taking a walk around the lakes on the Notre Dame campus when the Six World Travellers found me. I did not have a big idea when I started, certainly no plan to write a book. After reading the first wriggly piece I wrote (what was this thing anyway?—“Six world travellers met under a tree, cold stub . . . ”) Joyelle McSweeney, always so inimitable and expansive, said in the ND graduate poetry workshop, “Write more! !” And I did. Section after section showed up, intrigued or seized by motifs and chance absorptions and conceptual paroxysms. The Six World Travellers were storytellers and what better stories could they tell than about a relationship that had ended but was still eating me away, body and soul—the trauma and the striving and the tragicalness and the fuckedupness. Then I realized they were as affected as me by the politics of nationalism and fundamentalism; the forces of cultural policing; the might of a nation-state that is not really interested in protecting the rights of women, minorities, writers, artists, the poor, the ordinary folks; the compromised media. The fabric of democracy has been ripped, and we, the citizens of India, are walking around in tatters. I realized we are the world travellers. CLC: The title poem “Split” is the oldest poem of the manuscript, so in many ways, that poem is the genesis of the book. When my mother was thirteen, American soldiers approached her. With their fingers, they made snipping gestures, said, “Cut, cut,” then pointed to their helmets and then at her hair. Immediately after, my grandmother sent my mother off to live with family in Da Nang, for safekeeping. Who can know what they intended to do with my mother? It may have been a completely innocent request. But every time my mother tells me the story, there is an unsaid understanding that she was at risk of being raped as a young girl. As an undergrad and into my first year of graduate school, I wrote poems about my parents’ stories of the Vietnam War, their escape as boat people, and their first years in America. I felt that their stories had not been adequately represented and wanted to add their voices into the greater narrative of the War. Later, I began very seriously writing about my own experiences of being sexually molested as a child and the ways that those early incidents have echoed through my life. To me, my experiences and my parents’ stories are intimately intertwined, and they speak to each other as a kind of legacy of trauma, violence, and aftermath. LR: Your book began as a prizewinning manuscript [Monica was the recipient of the Sparks Prize at Notre Dame for the project that became Kala Pani, while Cathy’s book was awarded the Kundiman Prize]. What was that experience like for you, and what advice would you give to writers who are interested in the fellowship/contest circuit? MM: I completed the book a few weeks after I won the postgraduate Sparks fellowship. For the next few months, I sent the manuscript to contests, but 1913 Press picking it up was an instance of fortuity (for which I am grateful since I know this was the right press for Kala Pani!). That said, do your research: what aesthetic spectrum does the fellowship or contest you are interested in focus on? What is the relationship of your writing to that spectrum? Also, as impractical as it sounds, make sure your writing has friends, because it might not always be easy to believe in it yourself. Rejection is a fact of the writer’s life. No matter what, protect your vital relationship with your writing. CLC: When I found out that I’d won the Kundiman Prize, I was in complete shock. I’d been sending out versions of my manuscript for about two years, without any positive indication that it was headed in the right direction. At the time, I was using contest deadlines as a way to keep working on the book—and my hope was to have a book accepted for publication within the following five or six years. I think that when I’d submitted to the Kundiman Prize, it was the first time that I’d moved all my most immediate and emotional poems up front. And on a whim, I retitled it “Split” and also eliminated every last poem that I had any dissatisfaction with. Put your strongest work up front, but make sure that you can stand by every last poem in the manuscript. If a poem has potential but isn’t quite right yet, I’d cut it. I think people think that they need to include everything to show their range, but screeners are looking at hundreds of manuscripts! Nobody is going to question a manuscript that is on the lower end of the accepted page range. Find honest readers who you can trust, and exchange work with them. Don’t take rejection personally, be patient, and keep moving forward. I would also like to share a practical piece of advice from my friend Ocean Vuong about organizing a manuscript. Print out your poems. Find a large wall. Tape the poems up using electrical tape. Revise your poems by writing on them directly. When a sheet of paper is full of written revisions, update the electronic copy on your computer. Print out a fresh copy of the poem and replace the old one. When you can see all your poems in front of you, determining order is much easier. LR: Your career path post-MFA has taken you outside of creative writing as it exists in academia. How did you find yourself where you are now, and how does your writing life coexist with your studies or day job on a day-to-day basis? MM: Poetry is that extra, that trance-linguistic space I return to when the call is unavoidable. Pursuing the Ph.D. in East-West Psychology at CIIS has given me the courage to let everything I know die. But this is what gives life to my writing. For a while, I wrote poems at my ancestors’ altar every night. Right now, my dissertation proposal is emerging, and it may fold in poetry. The fold between poetry and theory. The crux, I believe, is how we live: is spirit, reciprocity, accountability, community: these are not antinomies of writing but repurpose it. As essential as dancing and ritual and grieving and love. Poetry is essential. CLC: My post-MFA career path has taken me everywhere! Since graduating four years ago, I’ve held nine jobs, sometimes three at a time. They’ve ranged from babysitting to delivering aerospace parts to teaching to interning at a publishing house. I now have two jobs: one full-time at a literary nonprofit and one part-time at another literary nonprofit. My writing suffers from having to compete with working fifty-plus hours a week, but I do the best I can to prioritize my writing. I get the most writing done during workshops, fellowships, residencies, so I make sure that I put in applications to those sorts of things. I also meet up with friends, and we do writing together. Balance is never easy, but I feel very fortunate to have jobs that enable me to do what I love: write my stories and spend the rest of the time serving other writers. Monica Mody‘s Kala Pani just came out from 1913 Press. Mody has published three chapbooks of poetry & cross-genre experiments, and her writing has appeared in The Harper Collins Book of English Poetry, &Now Awards 2: The Best Innovative Writing, Boston Review, The Volta, Dusie, and MiPOesias, among other places. Mody lives in San Francisco and is currently completing a Ph.D. in East-West Psychology at CIIS. Cathy Linh Che is the author of Split (Alice James, 2014), the winner of the 2012 Kundiman Poetry Prize. She received her MFA from New York University and is the recipient of fellowships from The Fine Arts Work Center at Provincetown, the Asian American Literary Review, Hedgebrook, Poets House, and LMCC’s Workspace Residency. She is a founding editor of the online journal Paperbag (paperbagazine.com) and is Program Associate for Readings & Workshops (East) at Poets & Writers.